A nonsensical monster-smashing good time anchored by a career-best performance by Dwayne Johnson. Davis Okoye (Dwayne Johnson) is a former elite soldier turn ape/gorilla expert at the San Diego Zoo. He’s made friends with the large, sign-language speaking albino gorilla George, whom he gets along with better than most people. But one night when George comes into contact with unusual technology that falls to Earth scattering across the United States when a space station exploded [in the opening scene of the film], his DNA becomes mutated and he begins to rapidly grow. Afraid of what’s going on, George escapes his captivity despite Okoye trying to calm him, and gets captured by a government organization in an op headed by Harvey Russell (Jeffrey Dean Morgan). Along the way, Okoye encounters Dr. Kate Caldwell (Naomi Harris) who claims she can cure George. She used to work for Claire and Brett Wyden (Malin Akerman and Jake Lacy) where it was her research that’s been altered to cause the mutation George is experiencing. The Wyden siblings are all about the bottom dollar, and want George brought in alive so they can study him and use what they learn to weaponize the bio-material that caused him to mutate. They activate a signal to bring him to them, pied piper style. Also drawn to Chicago by the Wydens is a giant spike-covered wolf that flies, and an even bigger monstrously mutated crocodile! The three behemoth creatures become hellbent on destroying Chicago, leaving Okoye and the others to try finding a way to stop them and – if possible – cure them. 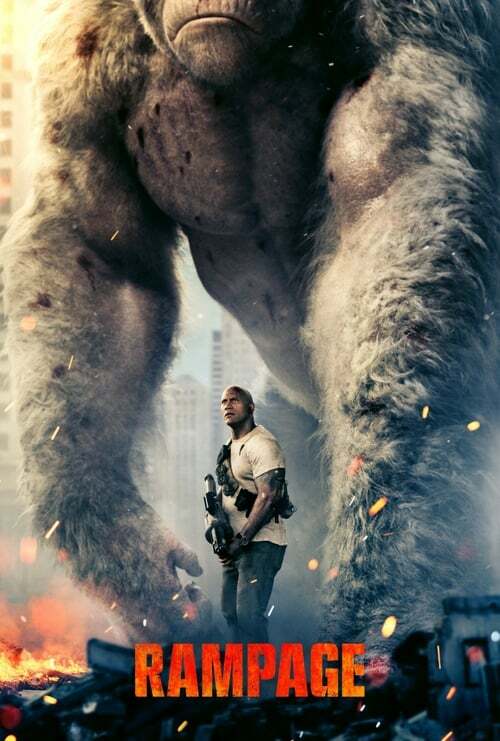 Rampage, based on the classic video game of the same title, is a whole lot of fun! There’s tons of monstrous chaos, explosions galore, and city destruction on par with Man of Steel. It’s a straight popcorn flick that’s meant to do exactly one thing: entertain the hell out of you. No one would ever confuse it with a “think piece”, nor are there really any deep themes evident among seeing a giant wolf rip through a special ops team or three enormous beasts working together to fell a building. It’s high-octane action that’s straight up candy for your eyeballs! I mean, in a world where we already have to suspend disbelief to believe a gorilla, a wolf, and a croc can not only grow to the size of a small building but contain DNA for more than a dozen other animals, is it too much to ask that life and death of the normal humans be somewhat believable? I guess so. This was probably the best performance The Rock, ahem, Dwayne Johnson has given to date – although Skyscraper is still on its way this year, so we’ll see. We’ve also got a pretty good performance from Jeffrey Dean Morgan (The Walking Dead) with a great moment of seeing these two huge men face-to-face and about to go to blows. The other actors involved give passable performances, but are overall forgettable among the monstrous menaces onscreen. The infectious fun of this movie may lay with director Brad Petyon, who’s worked with Johnson numerous times in the past with films San Andreas and Journey 2: The Mysterious Island. The mix of huge action scenes and story-building scenes keeps you on the edge of your seat waiting to see what’s going to happen next. It’s just that the thin story (with its many conveniences) bog down the enjoyability with at least a dozen eyerolls. Part of the reason may have been all the cooks in the kitchen with 4 writers including Carlton Cuse (San Andres and the TV series Colony), Ryan J. Condal (Hercules and TV’s Colony), and Adam Sztykiel (the Diary of a Wimpy Kid sequel and Alvin and the Chipmunks sequels), with story by Ryan Engle (The Commuter, Non-Stop)… and that’s just the writers who actually got credit for their contributions. So by all means, grab some snacks and check out Rampage. Just try not to think too hard about what you’re watching, which is seeing giant monsters destroy a city like the old arcade game. If you love seeing Dwayne Johnson save the day, even better. Sure, little in this blockbuster makes sense, and a more straightforward plot might’ve helped, but these are small critiques if you’re just looking for a monster-smashing good time!